Russian state-run arms trader Rosoboronexport and the Russian Helicopters holding are engaged in consultations with their Egyptian partners concerning a possible acquisition of Kamov Ka-52 'Katran' ship-based helicopters for the two Mistral-class helicopter carriers, originally built for Russia, that Egypt has agreed to buy from France, a source in an organization linked with arms exports told Interfax-AVN. "Indeed, such consultations are in progress. 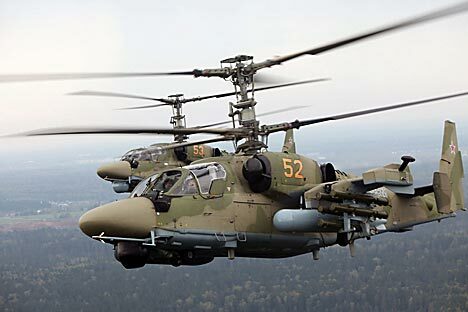 They deal with a possible acquisition by Cairo of some 30 Ka-52K 'Katran' ship-based helicopters that were initially supposed to be placed on board the French helicopter carriers and are 100 percent adapted for these ships," the source said. "The price of the contract will stand at over $1 billion," he added.